Stay tuned for upcoming events for Education based Drama and Comedy in near future. Education based Drama and Comedy show will be presented on 10th August 2017 at Pakistan Education Academy, Dubai. Education themed stage play titled GoodNews.com will be showcased by Sharafat Ali Shah. Non stop Laughter filled stand-up comedy act will be put forward by Hanif Raja. 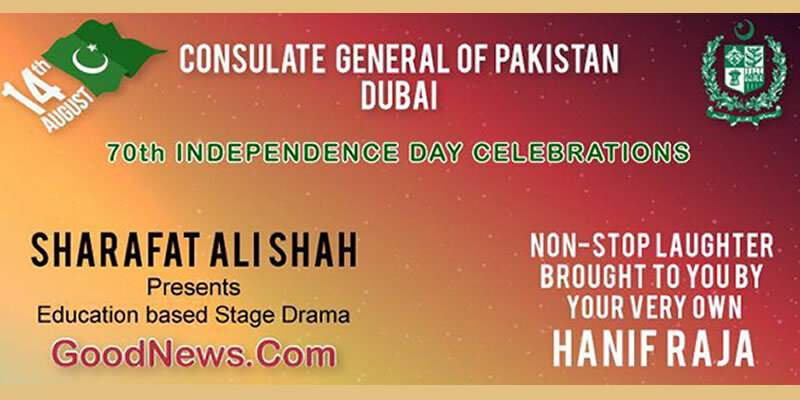 It is part of the 70th Independence Day Celebrations by Consulate General of Pakistan in Dubai. Best Viewed at 1024 x 768 pixels and above. This Page loaded in 0.05242 seconds on Fri, Apr 19, 2019 (07:00).